Continue to maximize transportation fleet savings and reduce carbon footprint for urban school district that serves approximately 25,000 students. More than 28 percent reduction in fuel costs, before tax benefits. Current price per gallon for propane autogas is $.95 versus $1.33 for diesel. 18,850 fewer pounds of nitrogen oxide emissions and 168 less pounds of particulate matter each year. 25 percent of the school bus fleet runs on propane autogas. When Anthony Jackson accepted the post of director of transportation for the Bibb County School District, he inherited 31 Blue Bird Vision Type C propane autogas buses. While he didn’t have firsthand experience with propane autogas, his previous research pointed to the benefits of using the fuel. “I found that the return on investment for propane looked like a much more viable option than compressed natural gas,” Jackson said. Dealing with tightening standards on diesel emissions led the district into problems related to diesel emissions reduction equipment — diesel particulate filters (DPF), manual regeneration, diesel emission fluid (DEF), and more. Operating on propane autogas instead of diesel removes the complexity and cost of after-treatment measures, which can accelerate return on investment and cut operating costs. With the propane autogas buses performing so well, the district made the strategic decision to begin shifting their fleet away from diesel, adding 22 new Blue Bird Propane Vision buses to the 31 propane-fueled Blue Bird buses already in the fleet. Now, Bibb County School District’s 53 propane autogas buses make up 25 percent of its total fleet. Equipped with a ROUSH CleanTech propane autogas fuel system, each Blue Bird Propane Vision runs on the Ford 6.8-liter V10 engine with a Ford 6R140 automatic transmission. The engine delivers 362 horsepower and 457 lb-ft of torque providing the performance drivers need for this urban area. Filling up the propane autogas buses takes place at a station located on the grounds of the district’s bus garage, which has a 4,000-gallon propane tank. Many school districts choose private on-site refueling due to the convenience and low cost. Installing propane autogas fueling infrastructure costs less than any other fueling station option — including gasoline and diesel. Because of its EPA classification as a non-contaminant, propane infrastructure has fewer compliance requirements than conventional fuels, meaning there is no costly EPA monitoring involved. District employees said they would much rather fuel the propane autogas buses, because they can avoid the frequent spills that result from diesel fueling as well as the resulting diesel odor on their clothes and hands. Plus, fueling is quick; a propane school bus fuels at 8 to 10 gallons per minute, a similar rate to diesel. Unlike gasoline or diesel, propane autogas is part of a closed-loop system, meaning the fuel is never exposed to air and won’t spill. As an approved alternative fuel under the Clean Air Act, propane autogas is a nontoxic, non-carcinogenic and non-corrosive fuel. Historically, propane autogas costs about 50 percent less than diesel per gallon and reduces maintenance costs due to its clean-operating properties. BCSD currently pays $.95 per gallon for propane autogas versus $1.33 for diesel. Added to those fuel cost savings is the $111,000 the district expects to receive in tax credits for using the alternative fuel. Maintenance costs are lower, too. The district’s propane autogas buses use 7 quarts of oil per oil change, and their diesel buses need almost three times that amount. For every two oil changes performed at 5,000-mile intervals, the filters for the propane buses still cost almost 40 percent less than those required for diesel engines, which are changed every 10,000 miles. With three parts carbon and eight parts hydrogen, propane is a clean-burning, low carbon fuel, with less nitrogen oxide, carbon monoxide and greenhouse gas emissions than conventional fuels. With each bus in Bibb County School District driving 25,000 miles per year, the propane buses in the fleet will reduce nitrogen oxide emission by 18,850 pounds and particulate matter by 168 pounds per year compared with the diesel buses they replaced. One of the top concerns in school district fleet management is total cost of ownership — especially when it comes to investing taxpayer dollars. With propane autogas, the return on investment is usually experienced within a few years, due to fuel and maintenance savings throughout the life of the bus. BCSD expects to see its ROI for the propane buses in four years. Bibb County School District has made a commitment to continue its move away from diesel. The district recently approved a plan to purchase more propane autogas buses and will replace outdated diesel buses with propane autogas as needed. About Blue Bird Corporation: Blue Bird is the leading independent designer and manufacturer of school buses, with more than 550,000 buses sold since its formation in 1927 and approximately 180,000 buses in operation today. 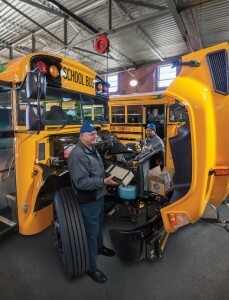 Blue Bird’s longevity and reputation in the school bus industry have made it an iconic American brand. Blue Bird distinguishes itself from its principal competitors by its singular focus on the design, engineering, manufacture and sale of school buses and related parts. As the only manufacturer of chassis and body production specifically designed for school bus applications, Blue Bird is recognized as an industry leader for school bus innovation, safety, product quality/reliability/durability, operating costs and drivability. In addition, Blue Bird is the market leader in alternative fuel applications with its propane-powered and compressed natural gas-powered school buses. Blue Bird manufactures school buses at two facilities in Fort Valley, Georgia. Its Micro Bird joint venture operates a manufacturing facility in Drummondville, Quebec, Canada. Service and after-market parts are distributed from Blue Bird’s parts distribution center located in Delaware, Ohio.